The Yoga Chakra is a body and soul driven institution which focuses on aerial yoga, yoganitrya and a complete vinyasa flow. They have some excellent yoginis taking classes and a fully-equipped studio space. The Yoga Chakra focuses on three forms of yoga practice. They teach aerial yoga, which as the name suggests is practiced off the ground, with the help of a hammock. It emphasises on the development of a healthy mind and soul through bending and stretching in mid-air against gravity. Yoganitriya is a very fascinating practice which combines both yoga and semi-classical dance together with sequential maneuvers with some yoga postures. Vinyasa Yoga mainly refers to coordination of body movements which allow the breath to flow from one pose to the next signifies Vinyasa flow. It’s a from of exercise which is derived from Ashtanga yoga school of thought. They have group and individual classes throughout the week at their studios in GK I and GK II. 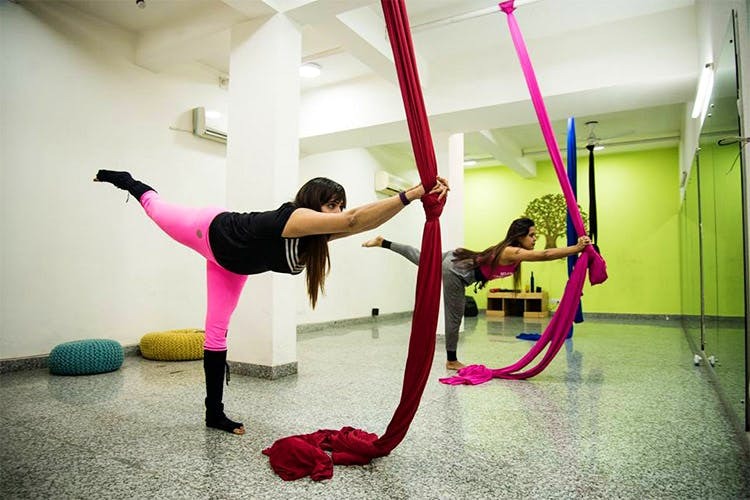 Aerial yoga will cost you INR 3,800 for eight classes. Yoganitriya will cost you INR 3,000 for eight classes and Vinyasa yoga will cost you INR 3,500 for 12 classes. Check out their schedule here. They have a three-month teacher training course in affiliation with The Yoga Alliance, a foundation that acquaints you with yoga and its benefits. You can either pay INR 40,000 for 200 hours or INR 90,000 for 500 hours. The Yoga Chakra stands out because they have some very unique ways of teaching and conceptualising yoga. The teachers are all certified and qualified and you’ll have a lot of fun while learning something new!